What’s the decision on decision support? The concept of radiology-specific clinical decision support (CDS) has been with us for some time now. The idea is simple: Give providers a tool that offers recommendations regarding the best imaging study for a given indication. Although the idea of CDS is certainly not new, there is no question that interest in deploying CDS has greatly increased since the Protecting Access of Medicare Act (PAMA) passed in April 2014. This resolution mandated the use of radiology CDS for advanced imaging studies in the outpatient setting as well as the emergency room in non-life-threatening conditions. Fulfilling the requirements of Nos. 1 and 2 took longer than CMS anticipated, delaying the implementation of No. 3 several times. The current deadline for requiring the use of CDS is January 1, 2020, unless a further change occurs. Subsequently, the identification of outliers (No. 4) has also been delayed. How did radiology CDS evolve to this point? 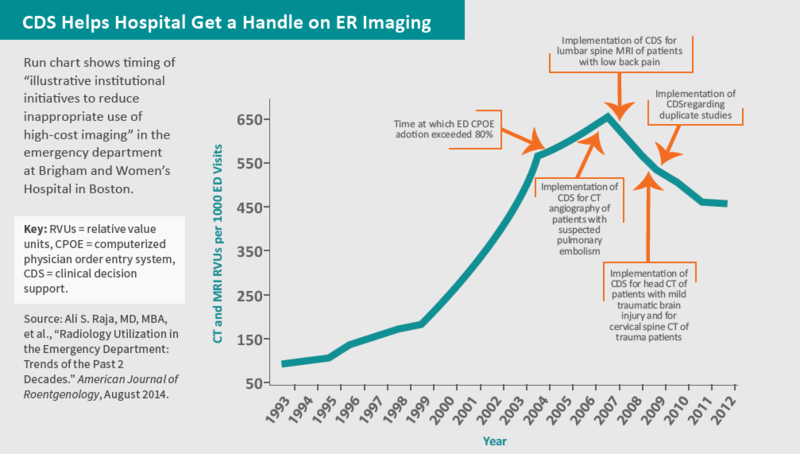 To understand the backdrop culminating in the passing of PAMA in 2014, it is important to note that, by the early 2000s, imaging utilization was skyrocketing at an alarming rate. Although it has plateaued since then, this trajectory spurred interest in methods to stop or slow the trend. Perhaps one of the most important was a pilot study in the mid-aughts by the Institute for Clinical Systems Improvement (ICSI) in which usage of CDS resulted in a claimed $150 million dollars of imaging savings. Notably, this study did not demonstrate a decrease in utilization. It simply showed a decrease in the rate of increase. Nevertheless, the ICSI study played a key role in spurring the 2014 legislation. Another study from this time period, authored by Taragin et al. and published in July 2003 by Academic Radiology, revealed that less than 50 percent of internal-medicine residents were able to answer more than half of a series of questions regarding the most appropriate study to order for given scenarios. Next, with the advent of meaningful use and promotion of EMRs through the HITECH Act of 2009, the stage was all but set for a CDS mandate. The use of radiology CDS was exactly the type of process that promoted health information technology. The question today is: Does CDS work? CMS appears to think so, hence the legislation. The ICSI study certainly suggests significant cost savings and decreasing rate of utilization when CDS is on board. This was backed up by Rosenthal and colleagues in the October 2006 edition of JACR, where their work suggested that employing CDS results in an improvement in the appropriateness of ordered imaging studies. Further, in 2009, Sistrom et al. published a study in Radiology showing CDS was associated with a nearly 3 percent decrease in CT utilization. Given all this evidence, and more, CMS is surely onto something in requiring CDS prior to ordering imaging studies. Meanwhile, having the appropriateness criteria embedded electronically in the EMR allows the ordering clinician to easily and reliably choose the best study. However, note that this form of CDS controls utilization indirectly by reducing the inappropriate orders. Let us examine this further. CDS as it is currently used gives guidance as to the best study to order for a given indication. In some cases, this may involve downgrading a high-cost study such as CT or MRI to a lower-cost study such as X-ray or ultrasound. As such, it can decrease imaging costs by decreasing utilization of high-cost studies when it recommends that a lower-cost study be obtained. On the other hand, in some cases the recommendation could be to change one high-cost study to another. In these scenarios, there is a lack of cost savings and in fact possibly even an increase in costs. All the same, the literature appears to support the theory that, taken as a whole, radiology CDS in its current form is likely to decrease imaging costs to at least some extent. However, consider a different form of CDS which gives guidance as to whether a study should be ordered. This would more directly attack the problem of utilization. For example, at my institution we have electronically implemented an algorithm that gives our clinicians guidance as to whether or not to order a head CT in the setting of pediatric minor head trauma. The algorithm is adapted from a l andmark paper published by The Lancet in 2009 (Kuppermann et al., “Identification of Children at Very Low Risk of Clinically Important Brain Injuries After Head Trauma”). Regardless of the form of radiology CDS employed, the tool will only be as useful as the degree to which the recommendations are heeded. Although we have so far seen that CDS can decrease costs, the ultimate effectiveness of CDS may ultimately hinge on the incentives that are attached to adhering to the recommendations. CMS clearly has similar thoughts, given their goal of eventually identifying outlier ordering clinicians and assessing penalties. The future of CDS lies not only in its current incarnation of providing guidance on which exam is best for a given clinical scenario. This current use of CDS has benefits from multiple standpoints. It has clear value in allowing the clinician to order the correct study at the point of service and can potentially decrease utilization of high cost studies by downgrading them to lower cost studies. However, its development to also include guidance as to when it is appropriate to order a study has the potential to take the value of radiology CDS to the next level. Combining these different forms of CDS and adding incentives to follow these recommendations very well may translate to future success in improving appropriateness of imaging and decreasing costs all at the same time. Dr. Lee is a clinical associate professor of radiology at Thomas Jefferson University and section chief of neuroradiology at Philadelphia-based Einstein Healthcare Network.